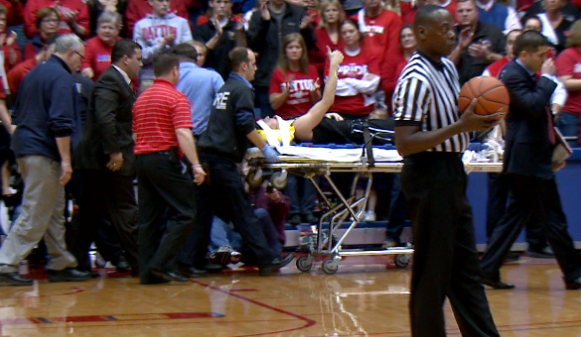 Butler’s Rotnei Clarke gives the thumbs up after injuring neck against Dayton. We’re just two games into conference play and all signs point to even more of a league battle than we may have even expected. For starters, things have gotten REAL physical, REAL early. On Saturday, Dayton’s Matt Derenbecker welcomed Butler’s Rotnei Clarke to the A-10 with a hard foul on a fastbreak that sent Clarke head first into the basket stanchion, resulting an a stretcher-assisted trip to a local hospital where Clarke was scanned and eventually diagnosed with a sprained neck. Clarke was back in the gym shooting a day later, but head coach Brad Stevens added that he would not play until “he’s 100 percent ready and cleared”. The Bulldogs host Richmond Wednesday before taking on Gonzaga this Saturday in a nationally televised contest. ESPN’s College GameDay will be at Hinkle that day, but the Bulldogs may be without their leading scorer in that one. Unfortunately for Dayton fans, the Flyers were unable to take advantage of Clarke’s absence with 8:13 left in the first half. Dayton trailed 18-16 prior to the injury but saw a Clarke-less Bulldogs team extend the lead to as many as 14 points before eventually winning it 79-73. The Bulldogs (14-2, 2-0) are just two of four teams that remain unbeaten in conference play, joining fellow newcomer VCU (14-3, 2-0), perennial A-10 power Xavier (9-6, 2-0), and the surprising Charlotte 49ers (14-2, 2-0). The Flyers (10-6) dropped to 0-2 in conference but are one of nine Atlantic 10 teams with at least 10 wins. Andrew Smith (Butler) – Averaged 18.5 points, 7 rebounds, 2 assists, and 1 block in Butler’s 2 wins. Treveon Graham (VCU) – Averaged 20.5 points and 6 rebounds while shooting 59% from the field for VCU in their first weekend of A-10 play. Semaj Christon (Xavier) – Averaged 18.5 points and 4.5 assists while shooting 57% from the field for Xavier in their undefeated start to A-10 play that included tough home win against Temple. Chris Gaston (Fordham) – Averaged a double-double of 19 points and 11.5 rebounds with 3.5 blocks in Fordham’s 1-1 start that included a tough 4-point loss to UMass. Branden Frazier (Fordham) – Fordham gets two for giving fans hope…and Frazier averaged a fan-friendly 18.5 points and 8 assists for the Rams this past week. One of my favorite stats is home attendance average. It’s a nice way to put a finger on the pulse of your program. Winning is great. Winning at a place where people care…even better. Below are the official home attendance averages according to Atlantic10.com, team record and percentage of capacity. Dayton, Ohio is one of the best college basketball towns in America. Well, for starters Dayton, Ohio is one of the best basketball towns of all the cities of all the worlds. The Flyers have been solid on the court, but have just three NCAA tournament appearances over the past decade (haven’t made it to a Sweet 16 or Elite 8 since 1984), yet rank in the top-30 in the country in home attendance and that’s without bringing the likes of Syracuse, UNC or Kentucky to their home arena. On top of that, Flyer fans pack UD Arena during the recently expanded NCAA tournament’s “First 4” for games against bubble teams. That’s a serious love of college hoops. It’s perhaps not surprising that just 50 some miles away lives an almost equally enthusiastic fan base at Xavier University. Somewhat on the other end of that spectrum you have to be a bit disappointed with the turnout from Butler and Temple fans (let the hate mail commence). Starting with Temple, the Owls average under 5,000 fans despite appearing in the last FIVE NCAA tournaments. For a team that was set to enter the Big East before it’s implosion, Owl fans appear to be one of the more unimpressed (and unimpressive) groups we’ve seen this season. Similarly, Butler went to back-to-back NATIONAL CHAMPIONSHIP games in 2010 and 2011 (not exactly ancient history), yet Bulldogs fans have managed to fill the historic Hinkle Fieldhouse to just 69% of it’s capacity, checking in just under 7,000 fans/contest. For comparative purposes, UNLV last went to back-to-back titles in 90-91, and a decade later more than doubled Butler’s home average following their consecutive appearances. We get it, the Bulldogs had a down year last year, but they are 14-2 with wins over the likes of Marquette, North Carolina, and previously top-ranked Indiana (a state rival)! If that, combined with the Bulldogs recent history can’t fire Butler fans up, I’d hate to see them during a string of bad seasons. La Salle is another fan base that could use a bit of a wakeup call. The Explorers are coming off a solid 21-12 NIT season and so far are off to a solid start at 11-4 (1-1). Sure, they’ve had just five winning seasons the past 20 years, so we understand the rust, but when you can’t sellout your 3,400-seat home gym against a visiting Big East state rival (Villanova), I have to question weather that fanbase belongs in a league trying to pass itself off as one of the best in basketball. Before joining the A-10, VCU fans packed the Richmond Coliseum for sold-out CAA tournament games. One fan base that certainly belongs in that type of league can be found in VCU. The Rams have sold out 28-consecutive home games, a streak that actually predates their appearance in the Final 4. With a season ticket wait list and an ever-improving national profile, that streak may go on for some time. Before joining the A-10 this past summer the Rams played their conference tournaments in the 11,200-seat Richmond Coliseum (their former home court). Appearing in the championship game every year since March of 2009, the Rams were a major part of four straight sellout title games there in CAA play.